The democracy is under severe attacks in West Bengal. The Trinamool Congress leadership is playing all the dirty tricks in its book to somehow stop the massive rise of BJP in the state. It has stooped to the level of disallowing BJP National President Shri Amit Shah’s chopper to land at BJP rally’s venue while creating problems for the organizers. It is really very painful to see that TMC goons have even tried to vandalize the decorations including posters, gates and cutouts of BJP leaders in a bid to vent out their own frustration of losing people’s support in the state. The democracy in our country draws strength from people’s support who have immense respect for democratic norms and values. It was in line with the same democratic spirit that people responded to the threat of TMC anti-democratic approach in large numbers making the BJP public meeting in Malda a huge success. It’s a warning signal for Trinamool in West Bengal. It is highly unfortunate to see that the TMC which came to power in West Bengal in opposition to Left Front’s anti democratic rule is today employing the same tactics to retain power in the state. It now appears convenient for TMC to rule the state through its goons and even excelling in hijacking the government machinery to serve its vested political interests. It has even exceeded the political atrocities of the Left Front and now believes in crushing opposition with its iron hand. The violence by TMC goons during panchayat polls in which many people lost their lives is a very unfortunate outcome of Mamata Bannerjee’s thirst for power. Not only this, in the most deplorable act of violence unleashed by the TMC goons, more than hundred BJP activists have lost their lives. In the fight for democracy in West Bengal, BJP activists are martyred by the mindless violence of TMC. The TMC now represents hooliganism, goondaism, corruption, misrule and violence in West Bengal. The TMC was voted to power under the slogan of ‘Poribortan’ in West Bengal. But it is very unfortunate to note that Mamata Bannerjee has led the state to worse from bad. She has failed to revive the rich legacy of the state which led the country on almost every front from culture to economy. When the wave of national movement swept the entire country, Bengal was at the centre of cultural regeneration but where the Left Front and TMC governments have led to West Bengal is for everyone to see. It has become a state where Durga puja processions are banned and Saraswati Puja is stopped for the politics of appeasement. The state which made India proud for its industries and trade has now been left far behind in the march of development and good governance. The unemployment in West Bengal is further compounded by illegal infiltration from neighbouring Bangladesh under the political patronage of TMC government in the state. West Bengal is a case which today sadly represents how a political leadership blinded by its vote bank politics can ruin the prospects of the entire state. It is highly appalling to see that a leader who has failed to guide its state towards development and good governance has the temerity to nurture a national ambition. West Bengal has witnessed overall decline under Mamata Bannerjee and yet ludicrously she feels that she can be acceptable at national level. 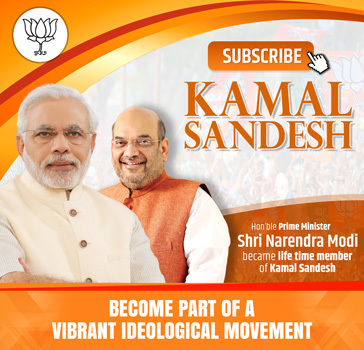 Shri Narendra Modi had proven himself by his long and extremely successful stint as Gujarat CM which resulted in massive demand for him as PM in every nook and corner of the country – it was that glorious saga of hard work, vision and commitment that people raised demand for him as PM at national level. But Mamata Bannerjee thinks she can fulfil her national ambition by ruining her state and by gathering a group of leaders who are already fighting for their survival in their respective areas. The people of West Bengal have already made their minds to give their mandate to BJP. The massive gathering at Malda rally addressed by BJP National Present Shri Amit Shah is the sign of the things to come. 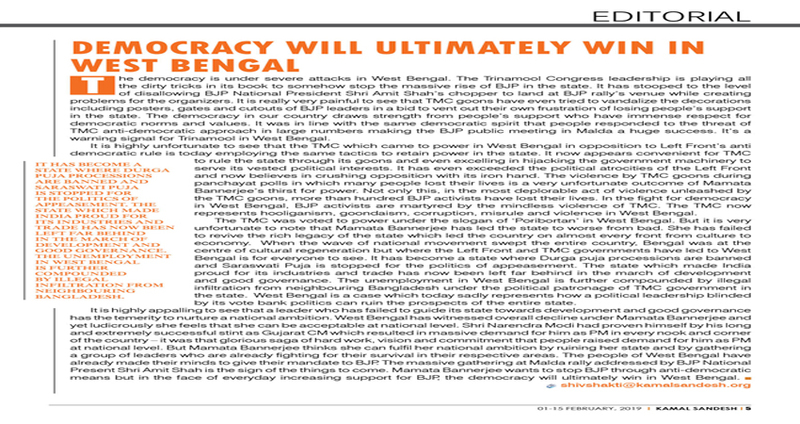 Mamata Bannerjee wants to stop BJP through anti-democratic means but in the face of everyday increasing support for BJP, the democracy will ultimately win in West Bengal.